YANGON, MYANMAR, 3 JULY 2018 – Access to vital information and resources, crucial for Myanmar workers looking for jobs in other cities and countries, is rapidly changing with the explosion of media and technology in the country. Speakers at today’s IOM X’s “Media+Tech for Migration” event in Yangon highlighted the role of innovation and how it is reshaping migration throughout the region. IOM X is a regional campaign to prevent human trafficking and exploitation sponsored by the International Organization for Migration’s (IOM) and the United States Agency for International Development’s (USAID). Organizers and their partners today shared their efforts to educate migrants in Myanmar about the evolving media and technology scene. The approach includes the promotion of a Facebook Chat Bot called Miss Migration, which helps process information queries efficiently, and the construction of a Myanmar-language website that provides migration tips and official government contacts for migration information. The videos were launched by His Excellency U Thein Swe, Union Minister for the Ministry of Labour, Immigration and Population, in Nay Pyi Daw in May. They align with national efforts to increase migrants’ access to information through Labour Exchange Offices and Migrant Resource Centres, which are featured in the series. The videos also show potential migrants how to visit a Migrant Resource Centre and how to submit a query to Miss Migration on Facebook, which may make the difference between a good or bad experience for themselves and their families. IOM Myanmar's Miss Migration Facebook page directs visitors to reliable migration information online. The page includes an easy-to-use chat function that guides users through a series of topics related to migration and directs them to the specific information they are looking for. 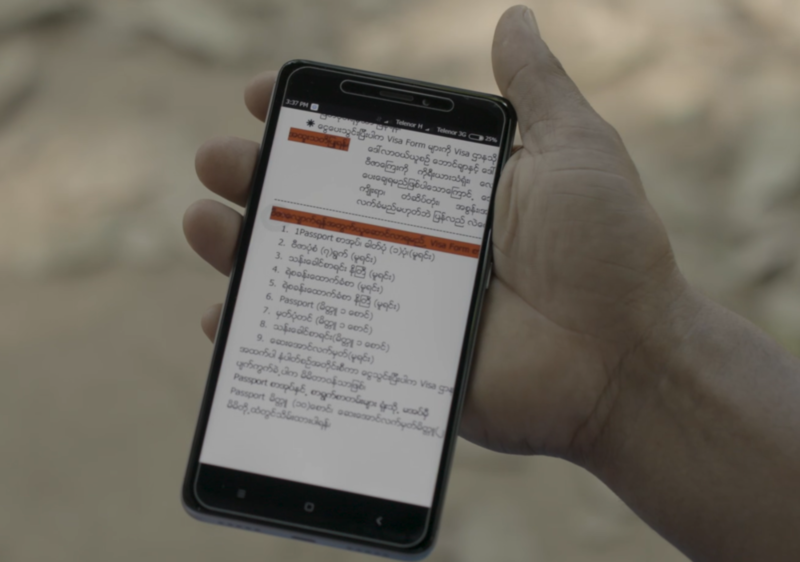 To date, the video series has gained significant traction, generating more than half a million views on social media and IOM X’s Myanmar website. The campaign is also supported by IOM X’s broadcast partners, Mizzima and the Democratic Voice of Burma, whose regular airings of the Make Migration Work video series is expected to reach millions more people this month. “We are proud to support IOM X's campaign to help people in Myanmar learn more about taking jobs in other cities and countries, and how to avoid being cheated or becoming a victim of trafficking,” said USAID Mission Director Teresa McGhie, who spoke at today’s event. For further information and to view the Make Migration Work videos, visit IOMX.org/mm (Myanmar language) or IOMX.org/mm/english. To chat with Miss Migration on Facebook, visit Facebook.com/MissMigration. Most Myanmar nationals migrate for better economic opportunities. The Myanmar National Census estimates that 4.25 million Myanmar nationals migrated abroad in 2014. There is also vast internal migration with around 9.4 million Myanmar nationals migrating within the country, accounting for around 17 percent of the population. Costs of arranging irregular migration (including transportation) range between US$275-$585, although some migrants pay as little as US$3 to cross into Thailand irregularly. Many migrants cannot pay migration fees up front, leading them to go into debt. On average, Myanmar migrants end up with a debt of around US$300-$500. Often, migrants are not aware of the full extent of their debt and how long they need to repay this. Migrating irregularly makes people more vulnerable to exploitation since they fear legal repercussions and are often too fearful to inform authorities when experiencing exploitation. The United States Agency for International Development (USAID) is the principal U.S. Government agency extending assistance to countries worldwide recovering from disaster, trying to escape poverty, and engaging in democratic reforms. USAID’s Regional Development Mission for Asia, based in Bangkok, oversees a broad portfolio of regional and transnational programs, and also provides support to several USAID bilateral missions in Asia as well as manages programs in countries in which it does not have a permanent presence. Its regional approach addresses problems that cross national boundaries, such as human and wildlife trafficking, emerging infectious diseases, malaria and HIV/AIDS. Please visit https://www.usaid.gov/asia-regional or @USAIDAsia on Facebook and Twitter for more information. USAID/Burma’s website can be found at https://www.usaid.gov/burma. IOM Myanmar, General Information – Overview. Available from www.iom.int/countries/myanmar. Trafficking in Persons from Cambodia, Lao PDR and Myanmar to Thailand (2017), pp. 103-105. UNODC, Trafficking in Persons from Cambodia, Lao PDR and Myanmar to Thailand (2017), pp. 108. IOM X, Baseline Study: IOM X Roadshow Myanmar (October 2017 – forthcoming). IOM defines irregular migration as movement that takes place outside the regulatory norms of the sending, transit and receiving countries. There is no clear or universally accepted definition of irregular migration. From the perspective of destination countries it is entry, stay or work in a country without the necessary authorization or documents required under immigration regulations. From the perspective of the sending country, the irregularity is for example seen in cases in which a person crosses an international boundary without a valid passport or travel document or does not fulfil the administrative requirements for leaving the country. There is, however, a tendency to restrict the use of the term "illegal migration" to cases of smuggling of migrants and trafficking in persons. UNODC, Trafficking in Persons from Cambodia, Lao PDR and Myanmar to Thailand (2017), pp. 137. UNODC, Trafficking in Persons from Cambodia, Lao PDR and Myanmar to Thailand (2017), pp. 138.